New Horizons will zoom past Ultima Thule at 12:33am ET on January 1, 2019, at speeds in excess of 31,500 miles per hour (50,700 kilometres per hour) and at a distance of around 2,200 miles (3,500 kilometres). We’ll be able to see the object in exquisite detail, but until then, project scientists are having to contend with an unexpected mystery. By analysing the hundreds of photos taken of the object by New Horizons thus far, project scientists have been trying to measure its brightness— but they’ve failed to detect periodic changes in Ultima’s luminosity as it rotates. Ultima Thule, as we already know, is not spherically shaped. Back in 2017, observations made from telescopes in Argentina suggested it was ovular or cigar-shaped, or possibly even two objects that are in super close proximity to each other (a binary pair) or possibly even touching (a contact binary). That’s all cool, as we’ve seen objects such as these before (here, here and here). What’s weird in this case, however, is that Ultima is not exhibiting repeated variations in brightness—the kind of thing you’d expect from a rotating object as its surface reflects incoming light from the Sun. These periodic pulsations of light—or light curves, in the parlance of astronomers—is all but negligible in Ultima Thule. So why is this distant Kuiper Belt object devoid of a detectable light curve? 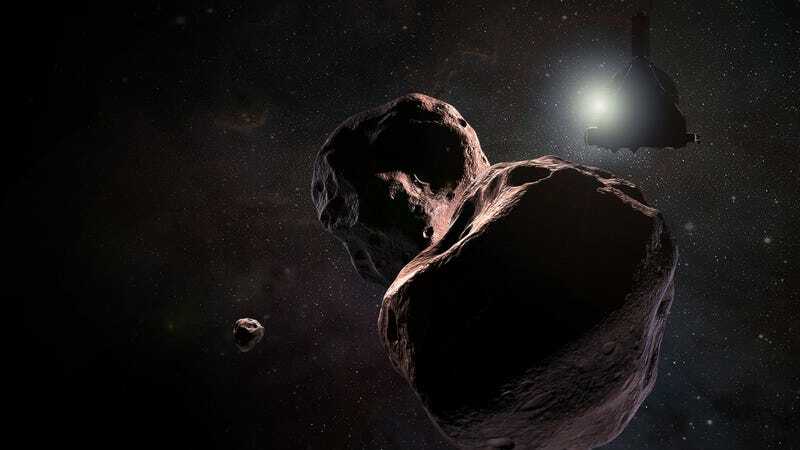 Marc Buie, a mission scientist from the Southwest Research Institute, said it’s possible that Ultima Thule’s rotation pole is pointing directly toward New Horizons as it approaches. So from the spacecraft’s perspective, Ultima Thule is spinning, but the spacecraft is only able to see the same reflective side—hence the absence of a light curve. It would be like watching a merry-go-round from directly above. It’s a good, and possibly the most plausible, explanation, but it requires that New Horizons just happens to find itself locked in this peculiar orientation with Ultima Thule. It’s another decent explanation, but as Showalter admitted, a heat source would be required to produce a coma of this magnitude. The Sun is 4 billion miles away from Ultima, and its rays are likely too weak to produce such an effect. Anne Verbiscer, a researcher at the University of Virginia and a New Horizons assistant project scientist, said Ultima Thule may be surrounded by many tumbling moons. In this multiple-moonlet scenario, each moon would produce its own light curve, but collectively, these curves would appear, the words of Verbiscer, as a “jumbled superposition of light curves.” From the perspective of New Horizons, it would look like a single, small light curve. The trouble with this theory is that we’ve never actually seen anything like this in the Solar System, so if it’s true, it would represent a new kind of astronomical phenomenon.